I finished my latest quilt this weekend, and took advantage of the glorious weather for a photo shoot. I really do love a curvy quilt illusion, and this pattern definitely delivers. The shape of the stars in this quilt strike me as a little bit retro, almost like they would look right at home on the side of a 1950's kitchen appliance. As neat as the blocks look on their own, I just love all of the cool secondary shapes created whey they're all together. I pieced the back with scraps, and used a solid rich shade of plum for the binding. When I pulled fabric for this quilt, I specifically chose colors that were getting a little heavy in my stash. Pink is not a color I reach for often, especially the shade of bubble gum pink in this quilt, but the deeper plum, teal, and aqua balance it out nicely. It's definitely a feminine palette, but not overly sweet. I'm working on the pattern for this one. I'm hoping to have it finished up by this weekend, so be on the lookout! It's definitely a fun one, and the blocks are pretty large, which helps the quilt go together in a flash. This is the lap size, and it finishes at 60" square. Great quilt! The colors are awesome. Such a cool vibrant quilt, great job. Kelly, what a cool quilt. I do love all the illusions:) Indeed it's like twirling your kaleidoscope and soaking in all the beauty and shapes. The deep plum binding is perfect. 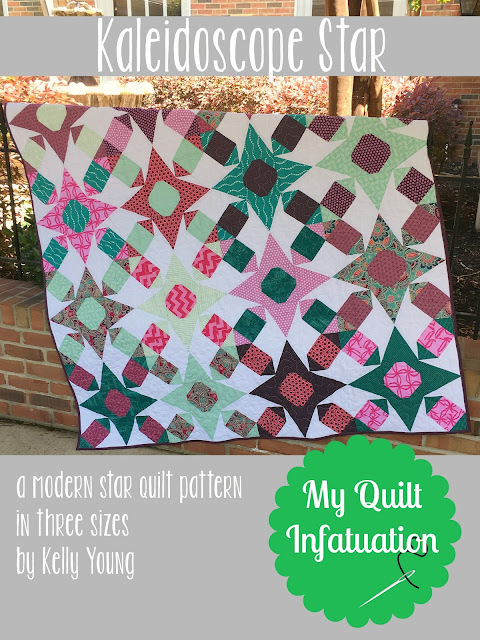 Kelly, I've always leaned more toward traditional quilts but once I found your blog, I've taken a decided interest in more modern colors and shapes. If I can ever get caught up on my current list of projects, I would really love to try one of your patterns. You've been a real inspiration for me. Now to decide which one! You've got a winner there - LOVELY! Oh I gotta have this pattern!! I too, like the looks of this curvy star. I also like the sound of large blocks & going together fast! Great quilt. Very nice quilt! You do such a nice job on your designs. Having nice weather really makes a world of difference when trying to take good quilt pictures... this doesn't always happen in Northern Germany. In one moment it can be raining and grey one minute, and the sun pops out for five minutes (long enough to take pics), and then it's grey and raining again. Lovely finish and fun shapes. Scrappy backings are the best! Love the color combinations in this quilt. Another one that will be fun to make. Congrats. Hope the pattern writing is going well. Needle and Thread Thursday, Friends!